I met these cool guys after my lecture at the architecture faculty at the National Autonomous University of Mexico. They are readers of Cycle Chic - I'm always humbled and amazed to meet readers around the world. I noticed the cool paint job on the bikes and the chap on the right told me he paints them by hand. 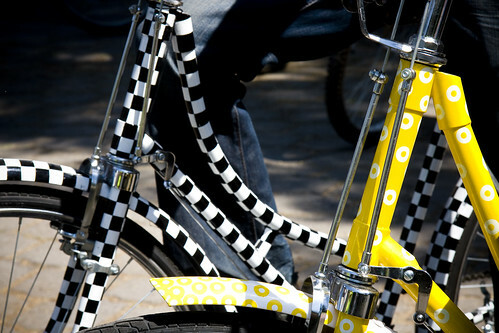 It takes four days per bike but THAT is personalising your bike in extreme style. Wicked cool. Cool bikes made cooler with TLC and paint. 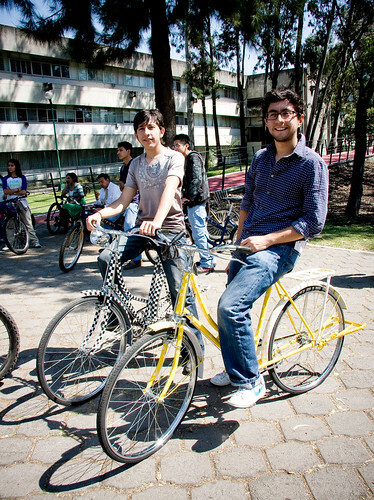 Here's a friend of theirs riding one of the hand-painted bikes on Reforma boulevard on Sunday. And a close up. Kind of. Of the paint job(s). Love to see these bikes around town. So much passion goes into them. Always wonder about the individual behind the bike - they must be awesome. The people of Mexico certainly know how to decorate a bike. I wonder if she really know well how to ride it. they are very impressive paint jobs. It would be good to see some over here in Australia! I've seen one example of bike painting here in Montreal: a bike painted basically in red and covered completely with little flowers in thick raised, enamel-like paint. I'm always happy when I get to chance upon it. I'm also glad to see that they don't have the issues with males riding step through frames like we do here in the U.S.A. A bicycles a bicycle, and the right frame for the right job. I've always wondered what that aversion to step-through frames is about. Seems to me the bar on "boys' bikes" is kind of, um, dangerously placed... Run up on a curb too quickly and you could damage the Family Jewels! Love the paint jobs! what are those bar things behind the rear wheels on the red and yellow ones? the bar at the back is a bumper. used to be a standard fixture on most bicycles. to avoid other cyclists bumping into your back wheel. The bar at the back is used as well as a stand help. You pull it down and it make the bike to stand all by itself. Very useful.